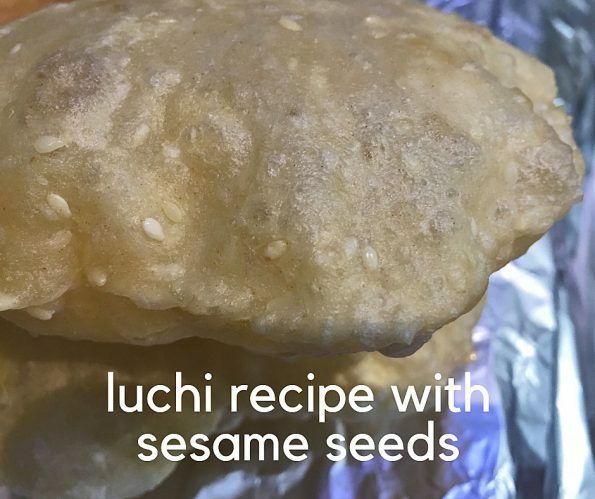 This Bengali luchi recipe follows the method of preparing bengali style luchis, but I also added white sesame seeds to make it more crunchy and more delicious with the added flavors from crunchy sesame seeds. 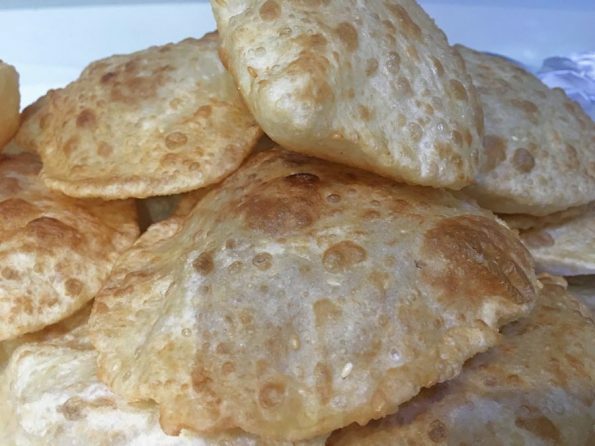 This luchi recipe is very much like Indian traditional bread known as luchi, made using all purpose flour. But its quite different from the previous recipe on luchi puri I have here, which is made with added sooji flour and sugar. So with this Bengali luchi puri recipe, I have two different versions of luchi puri recipes in my blog. 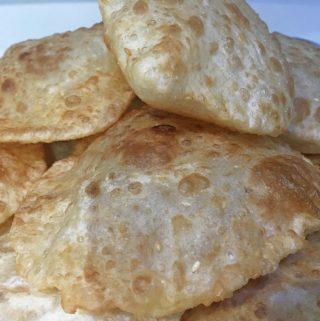 Authentic Bengali luchi recipe uses only all purpose flour to make the luchi puri, while the luchi puri recipes from other parts might include wheat atta flour, sooji flour etc as well. This luchi recipe only uses all purpose flour as the flour but we also add sesame seeds which makes it slightly crunchy and more delicious. Also I mixed the flour in a different way for this recipe, which was more easy to do. The addition of sesame seeds (I used white sesame seeds since that’s what I had at home) is not something in the traditional Bengali luchi recipe, but I added the sesame seeds to the luchi dough to make it more crunchy (and sesame seeds are healthy too) and it was so delicious with the added crunchy texture from sesame seeds. If you love Bengali luchi puri, try it with this twist by adding sesame seeds which will make it even more delicious and crunchy in texture. Adding sesame seeds can easily make recipes more delicious and healthy too (if you are not allergic to sesame as some people may be allergic to it). I also have this easy and delicious vegan sweet potato soup recipe with added sesame seeds here where I added sesame seeds to make the soup more delicious and healthy. 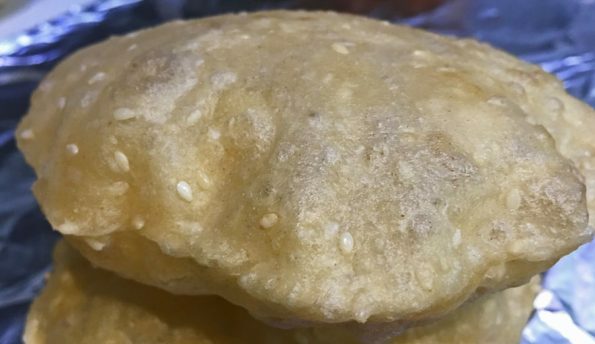 So here is how you can make simple and delicious luchi pooris with sesame seeds following this easy Bengali luchi recipe with added sesame seeds. 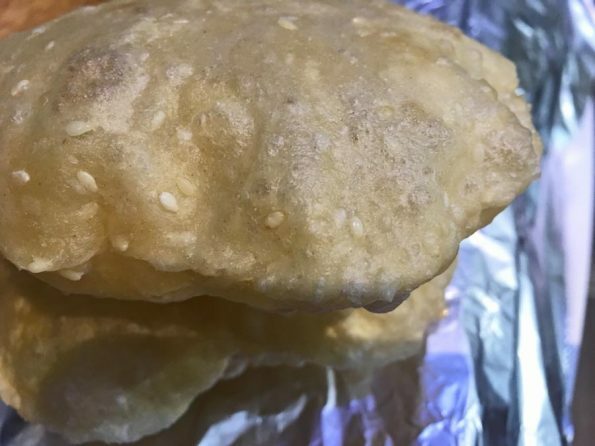 Easy and yummy Indian Bengali style luchi puri (fried puffed flatbread) with added sesame seeds which makes it even more crunchy and delicious. In a large bowl, mix together the flour, salt and sesame seeds until well mixed and salt and sesame seeds are distributed evenly. Add the one cup of water and mix the dough, knead for about a minute. Add the ghee and knead well for another one minute. Finally, if you are adding the oil, add the oil and knead the dough for another couple of minutes, make sure the ghee and oil added to the dough are evenly distributed in the dough you made. Keep the dough covered for a few minutes, say 5 to 10 minutes of time. In a flat surface, roll out the first ball very thinly. (if you do not roll out the balls thinly, it will be difficult to puff the bread, so it is best to make the balls very small sized and roll them out very thinly). Heat the oil in a frying pan and add the first thinly rolled out dough of bread. As the bread puffs up, gently press down using a spoon of good quality spatula and as it cooks fast, gently flip and cook the other side too. Transfer the cooked bread to a serving plate or foil lined with paper towel so the excess oil will be absorbed to the paper towel. Similarly fry all the breads until the dough is all finished. Served the puffed bread hot with any curry or raita or yogurt as you wish! 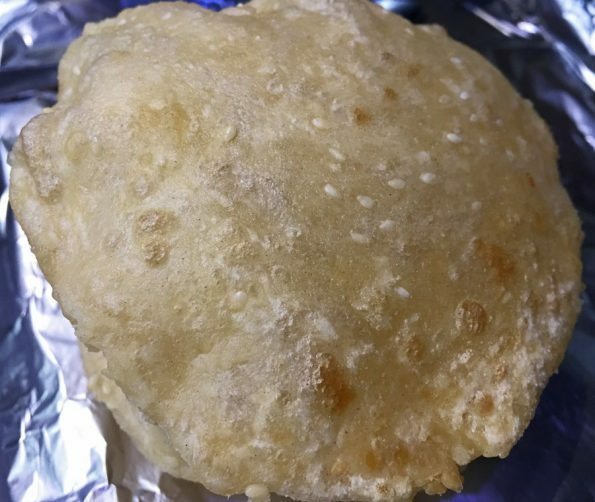 Hope you found this post on Bengali luchi puri with added sesame seeds helpful in making easy and delicious luchi puri for breakfast or any festival or special occasions.